This Grilled Salsa Verde is not your average salsa verde. 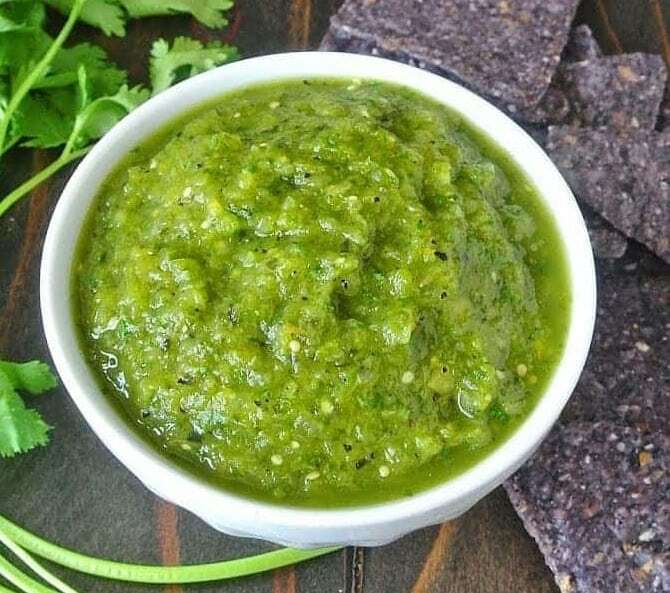 Grilled tomatillos, pasilla peppers and jalapeño with added sweetness from pineapple, this is a salsa so full of flavor you’ll find it hard to put down the tortilla chips. This salsa has some many uses, in addition to dipping tortilla chips into. Earlier this week, I made shredded chicken baked taquitos. Most recently, I used it in grilled beef stuffed poblano peppers by mixing it with the ground beef. So good! 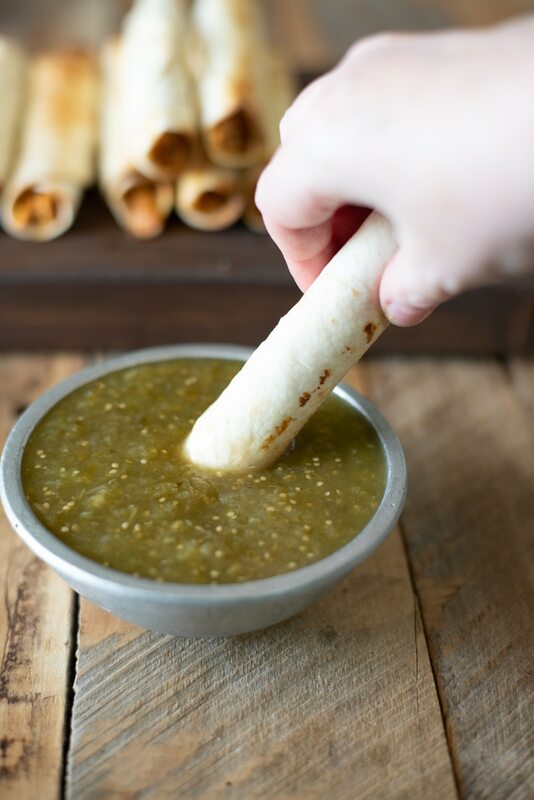 Dipping a melted cheesy taquito into salsa is a requirement, but regular tomato salsa, meh, it’s not exciting enough, I wanted something sweeter. So as I was grabbing the cilantro in the produce department, tomatillos caught my eye. I have never cooked with tomatillos before and now is a great time to try. Ok, so there’s 2 green components of the salsa verde, what about the rest of the ingredients? Well, jalapeño, of course and next to the jalapeño’s were pasilla peppers, great. 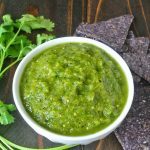 How do you make salsa verde? Just throwing all these ingredients into the food processor to whip up the salsa just did not sound exciting enough in the flavor department. It’s still grilling season, why don’t I grill the ingredients? Perfect! They grill up really quickly on a hot grill. I got a great char on the pasilla and jalapeño peppers, and let them cool in a bowl covered with plastic wrap and the skins just peel right off using a paper towel. After blending everything in the food processor, I tasted the salsa and it was missing a little sweetness. After looking through the pantry I had a small can of crushed pineapple and let me tell you, what a fantastic flavor combination. The tomatillos don’t need to be grilled, but the flavor difference must be night and day. I can’t say because I only tasted them grilled and that works for me. 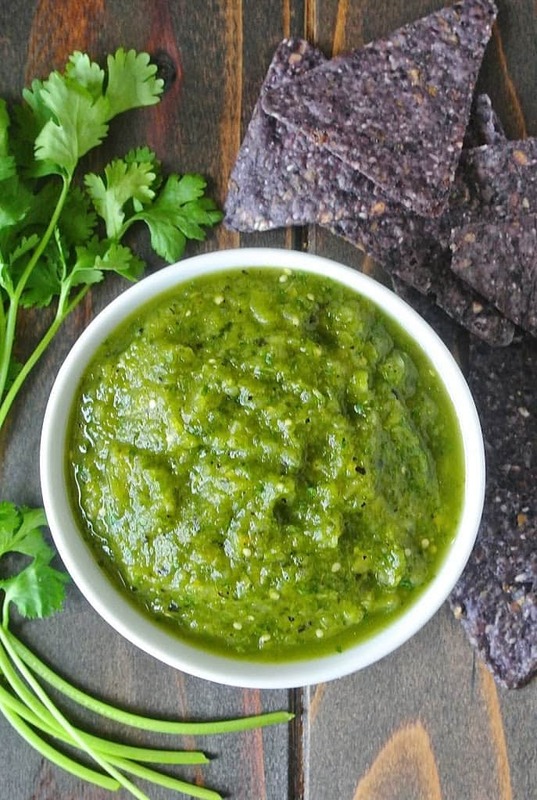 If you’ve tried this Grilled Salsa Verde or any other recipe on the blog then don’t forget to rate the recipe and let me know how it turned out in the comments below. I love to hear from my readers! This grilled salsa verde is not your average salsa verde. Grilled tomatillos, pasilla peppers and jalapeño with added sweetness from pineapple. This is a salsa so full of flavor you'll find it hard to put down the tortilla chips. Grill the pasilla peppers and jalapeño until the skin is blackened. Put the roasted peppers in a glass bowl and cover with plastic wrap for 30 minutes. 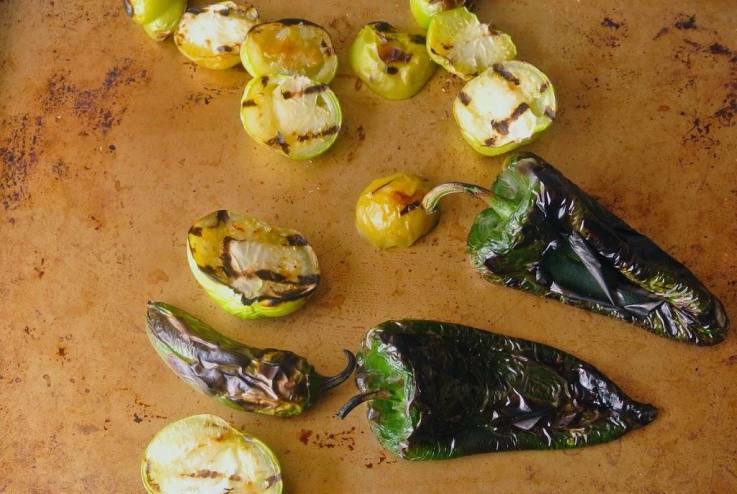 Grill the tomatillos for 3 minutes per side , set them aside. When the peppers are cooled, using a paper towel rub them to remove the skin and roughly chop. Add all the ingredients to a blender and blend until puréed. This looks great! A couple years ago I grew tomatillos, and I had so many that I couldn’t keep up! I made salsa and froze it like every week! I’m happy to have a new recipe so that I can use them up if I grow them again. Thank you Jessica, it’s my new favorite salsa. 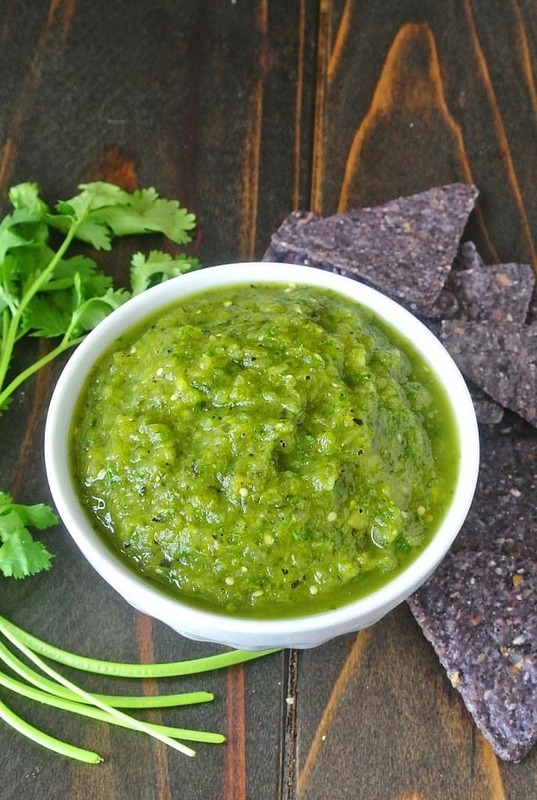 Sounds yummy — love salsa verde! Pinned!